In 1999, Louise Bourgeois was 88 years old. Extraordinarily, she chose this late point in her long career to take her creative output in a completely new direction; eschewing the metal, marble and bronze that had characterised her earlier work, Bourgeois started to produce sculptures out of fabric. This was a move that was both radical and subversive. In many cases, Bourgeois returned to old ideas and remade them in fabric, exchanging bronze for pink flannel, for example. In doing so, she drew attention to the gendering inherent in our conceptions of materials, where hard bronze and marble are seen as traditionally masculine, whilst soft fabric is seen as feminine and as a ‘lesser’ material. Artistic materials and categories are subject to a gendered hierarchy, which Bougeois’s fabric works both indicate and forcefully subvert. Fabric speaks directly to the female condition and to the female body. As Rozsika Parker, the definitive expert on women’s craft in art, suggests, ‘Bourgeois’s work brings out the deeper meanings of textiles’ evocation of women’ because ‘in her work fabric is associated directly with female sexuality, the unconscious and the body.’ Fabric’s softness and malleability, along with its tactile similarity to skin (particularly in Bourgeois’s pink fabric), associates it both with sensuality and with childhood recollections of maternity and its material comforts, and therefore with the feminine. Bourgeois is a woman artist making works that are inherently and self-assertively ‘feminine’ in their subject matter, colour and materials. By using sewn fabric as her medium for artistic expression, she is drawing on a long association between women and the craft tradition. The 1970s feminist movement did much to revive interest in female craft traditions as a means of rebellious self-expression. From the 1970s onwards there was a steady stream of women artists working in fabric using traditional craft techniques within the ‘fine art’ tradition as a challenge to the dominant privileging of ‘masculine’ materials and artistic processes. Bourgeois did not start working with fabric until some considerable time after the main thrust of the feminist movement, perhaps allowing her a gap for reflection. However, Bourgeois is certainly not the only female artist working with fabric around this time; consider Tracy Emin, Sarah Lucas, Karine Jollet, Moira Chester, Melissa Ichiuji, Mary Tuma, Laura Ford and Annette Messager, to name but a few examples. Feminism espoused sewing and craft because they are typical, everyday features of a woman’s traditional life. The quotidian nature of the craft tradition, and its historical role as an important part of female existence, similarly allowed Bourgeois to engage with everyday modern life, despite being drawn from a culture that is centuries old; Bourgeois’s relationship to craft is notably open-ended and exploratory. Embroidery has been the means of educating women into the feminine ideal, and of proving that they have attained it – witness the history of samplers, for instance – but it has also proved a weapon of resistance to the painful constraints of femininity. […] Limited to practising art with needle and thread, women have nevertheless sewn a subversive stitch, managing to make meanings of their own in the very medium intended to foster polite self-effacement. Women’s relationship with sewing has always been a complicated one. Parker does not present embroidery as an outright act of rebellion, suggesting that it both enforced domestic roles and accepted definitions of femininity, but also simultaneously provided an artistic and discursive space within which women might take the opportunity to express themselves. She argues that ‘the art/craft hierarchy suggests that art made with thread and art made with paint are intrinsically unequal: that the former is artistically less significant. But the real differences between the two are in terms of where they are made and who makes them.’ That is to say, art made with thread is produced by women in a domestic context (traditionally for a domestic purpose) whilst art forms such as painting and carving are historically usually produced by male artists within studios or the academies. 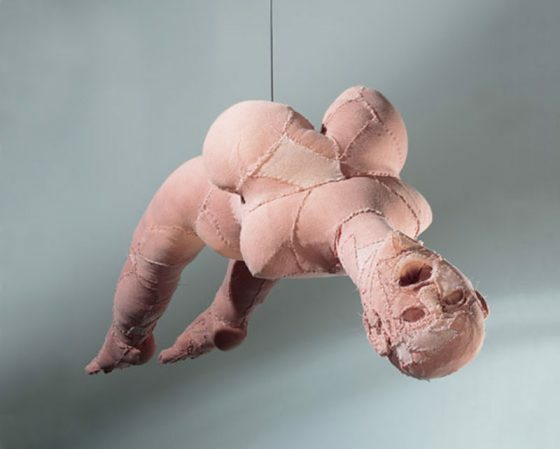 Louise Bourgeois and her sculptures such as Arched Figure hold a highly unusual position within this discourse. Sewing is an activity that can be done at the kitchen table, which is where Bourgeois spent most of her time while she was producing her fabric sculptures. These small dolls were produced in the home by an elderly woman, playing to traditional associations between the craft of sewing, the feminine and the domestic. However, much as the bad stitching of this work belies Bourgeois’s sophisticated sculptural technique, the situation is more complex than it first appears. Bourgeois worked from her home throughout her career and had a studio in the basement of her Chelsea brownstone. As her long-time assistant Jerry Gorovoy puts it, ‘the whole house was a studio. Louise was not into domesticity at all.’ Bourgeois combined the home and the studio in a unique way. Photographs of her house after she died show a tall pyramid of gifts where biscuit tins and whiskey bottles are sculpturally stacked in order of size, much like her fabric pyramidal sculptures such as Untitled (2001). In the basement hang huge dismembered limbs sewn in pink fabric, surrounded by tables covered with spare fabric, spools of thread and domestic items like a radio, a dustpan and an iron, which was presumably used to remove creases from fabric before she transformed it into sculpture; her sculptural tools during this period are also those used for household chores. Working from her kitchen table suited her age, her working method and her type of production. For Bourgeois, whose art is both personal and universal, the spheres of domesticity and artistic production are inherently linked. This chimes closely with how Bourgeois saw sewing as a sort of emotional ‘reparation’, whilst also acting in a ‘transformational’ capacity. Rozsika Parker writes in her introduction to the 2000 reprint of The Subversive Stitch that, had Bourgeois begun working with fabric earlier, she would have been the subject of a good proportion of the final chapter of the book. She suggests that ‘her work, to my mind, associates stitching not only with reparation but also with aggression and destruction’, comparing this to ‘the dual face of embroidery’, which acts as a running theme in her book. It seems all too likely that only in the feminist art world will there be a chance for the “fine” arts, the “minor” arts, “crafts”, and hobby circuits to meet and to develop an art of making with a new and revitalized communicative function. […] Visual consciousness raising, concerned as it is now with female imagery and, increasingly, with female process, still has a long way to go before our visions are sufficiently cleared to see all the arts of making as equal products of a creative impulse which is as socially determined as it is personally necessary. However, it seems unlikely that Bourgeois would have been able to make and exhibit these works if she didn’t have her hugely long career behind her, during which she had worked with almost every available material, including traditionally masculine bronze and marble. She also had the accolades of the artistic world to her name, particularly in her retrospective at MoMA in 1982. Her hand-crafted works are almost invariably displayed in an institutional context, suggesting that these fabric works exist at a complex intersection between art and craft, feminism and femininity.